Bumper Protector Instructions for using the Bumper Bully on your vehicle. 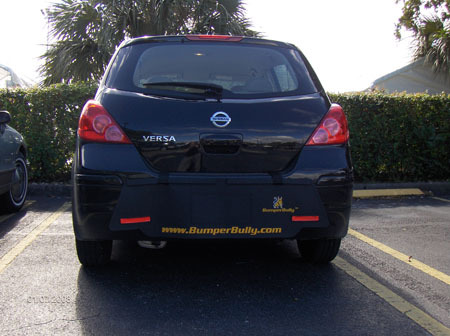 With it’s unique flat design the Bumper Bully does not take up much space and is easily stored in your vehicle’s trunk. Since this bumper protector is very light and foldable, it can be folded and placed almost anywhere in your car, truck or SUV. It is easiest to use when stored in your trunk. So first clean out your vehicle’s trunk and make space for the Bumper Bully. 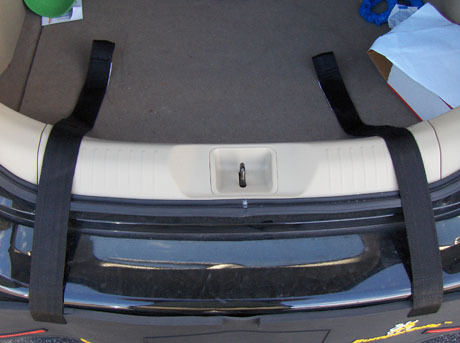 Lay the Bumper Bully protector flat across the width of the inside of the vehicle trunk on top of the black straps. Note: The Bumper Bully protection measures a very wide 46" ” x 12" ” in size this maximizes coverage protection of your car bumper. When parking simple open your vehicle’s trunk and drop out the Bumper Bully over your bumper. The Velcro straps will hold the bumper protector in place. Close your vehicle’s trunk and your done! If the above steps were done correctly, the Bumper Bully protector should hang over the rear bumper providing great protection when street parking. Depending on your vehicle’s trunk size and bumper depth, you may have to adjust the placement of the Bumper Bully straps in your vehicle trunk. For larger bumpers and bigger vehicles the Bumper Bully Velcro straps will have to be placed closer to the front of the trunk. For smaller vehicles the Bumper Bully Velcro straps will have to be placed further back in the trunk. After the 1st time you position the Velcro straps inside your trunk, putting the Bumper Bully guard on your vehicle will take 2 second to do. Note: The 2 thick black straps also act as security, preventing people from removing the bumper guard protection off your car. >> Go back to the Bumper Bully rear bumper protector page.